THE CHEMISTRY among actors Razif Hashim, Stephanie van Driesen and Omar Ali is amazing to watch. You can feel the tension in the air. Even their director, Joe Hasham, looks satisfied with what his actors have created on stage at the rehearsal for Betrayal. The Actors Studio Seni Teater Rakyat’s latest production will open at the Kuala Lumpur Performing Arts Centre (klpac) this Friday and runs till June 4. 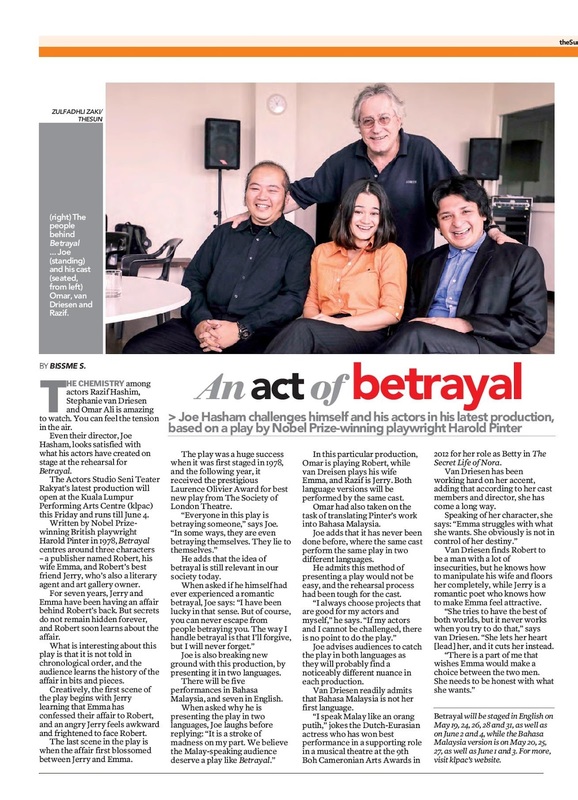 Written by Nobel Prizewinning British playwright Harold Pinter in 1978, Betrayal centres around three characters – a publisher named Robert, his wife Emma, and Robert’s best friend Jerry, who’s also a literary agent and art gallery owner. For seven years, Jerry and Emma have been having an affair behind Robert’s back. But secrets do not remain hidden forever, and Robert soon learns about the affair. What is interesting about this play is that it is not told in chronological order, and the audience learns the history of the affair in bits and pieces. Creatively, the first scene of the play begins with Jerry learning that Emma has confessed their affair to Robert, and an angry Jerry feels awkward and frightened to face Robert. The last scene in the play is when the affair first blossomed between Jerry and Emma. The play was a huge success when it was first staged in 1978, and the following year, it received the prestigious Laurence Olivier Award for best new play from The Society of London Theatre. “Everyone in this play is betraying someone,” says Joe. Joe is also breaking new ground with this production, by presenting it in two languages. There will be five performances in Bahasa Malaysia, and seven in English. In this particular production, Omar is playing Robert, while van Dreisen plays his wife Emma, and Razif is Jerry. Both language versions will be performed by the same cast. Omar had also taken on the task of translating Pinter’s work into Bahasa Malaysia. Joe adds that it has never been done before, where the same cast perform the same play in two different languages. He admits this method of presenting a play would not be easy, and the rehearsal process had been tough for the cast. “I always choose projects that are good for my actors and myself,” he says. Joe advises audiences to catch the play in both languages as they will probably find a noticeably different nuance in each production. Van Driesen readily admits that Bahasa Malaysia is not her first language. “I speak Malay like an orang putih,” jokes the Dutch-Eurasian actress who has won best performance in a supporting role in a musical theatre at the 9th Boh Cameronian Arts Awards in 2012 for her role as Betty in The Secret Life of Nora. Van Driesen has been working hard on her accent, adding that according to her cast members and director, she has come a long way. Van Driesen finds Robert to be a man with a lot of insecurities, but he knows how to manipulate his wife and floors her completely, while Jerry is a romantic poet who knows how to make Emma feel attractive. “She tries to have the best of both worlds, but it never works when you try to do that,” says van Driesen.